Discussion in 'Sales & Promotions' started by Absolute-Wood, Aug 5, 2016. My name is Rick, and I run Absolute-Wood. We've made vape stands since late 2011. 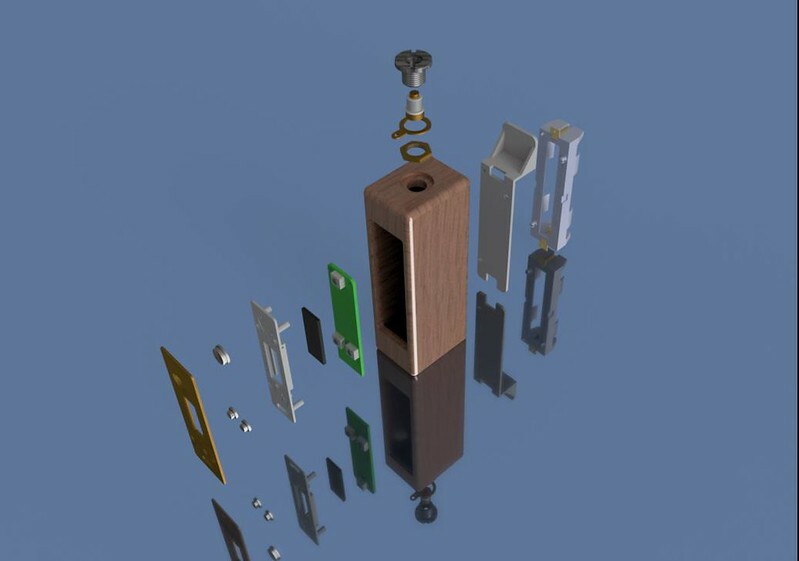 I've been a Mechanical Designer for over 20 years and have designed a great array of products over the years. Please visit our forum here to learn more about us. 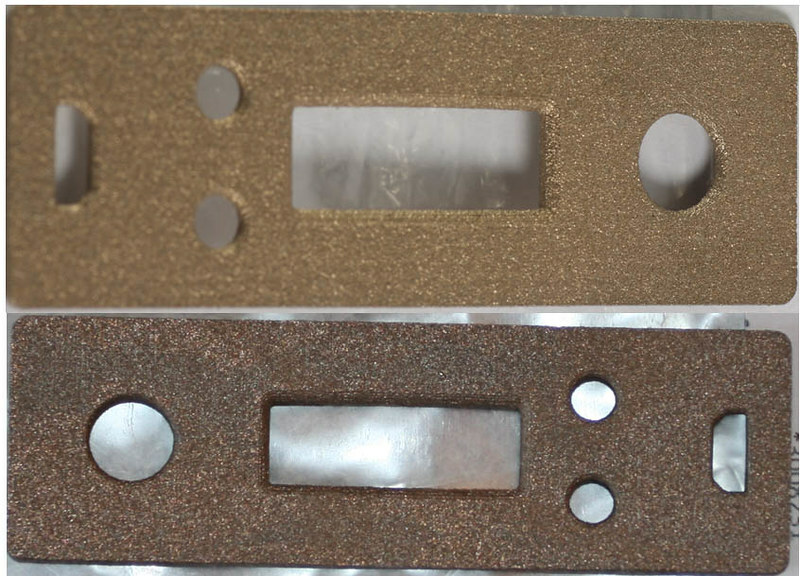 The Faceplates (and buttons) will be available in Plastic, Stainless Steel & Brass (shown above). They will actually be two DNA40's from dis-assembled new PV's (bought for this) and one with a new DNA75 chipset. 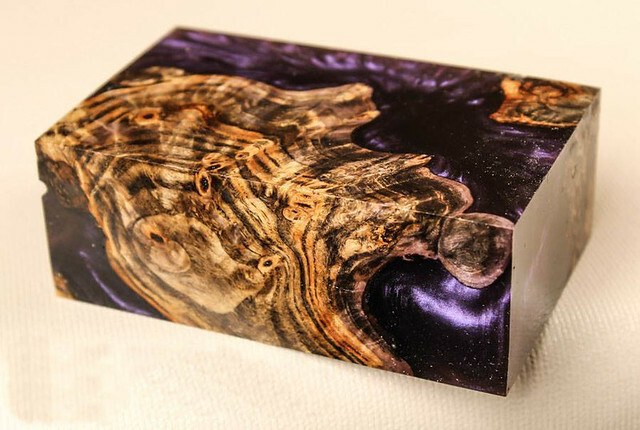 Probably one in single species with a plastic faceplate, multi lamination version, and I have a pretty cool purple, blue, slate and orange piece of stabilized maple burl I will probably utilize for one of them. Sorry, but the three test units already have been assigned for local evaluation. David Wolf, skt239, kross8 and 2 others like this. Here's the animation of the 2 x 18650 device - the Model II. It took many minor adjustments (read: start over because of stupid oversight), but I finally got the full animation of the Model II device completed. This unit also features all American parts - Evolv DNA chipset, Keystone battery holder, Fat Daddy or Varitube 510 connector and 3D Printed parts. This particular model features a laminated body - Wenge center strip with Caribbean Rosewood on the sides. 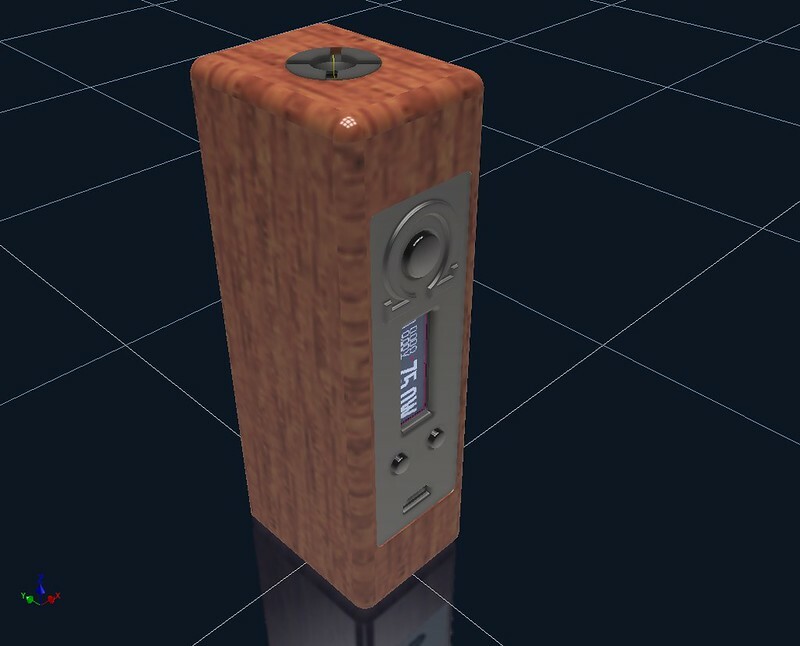 Unfortunately, my CAD program doesn't do justice to exotic woods - pics will be better when they come. ieatOhms, kross8 and LarryPer123 like this. kross8 and Absolute-Wood like this. Very interesting ... looking forward to seeing the actual prototypes. The pieces are finished now, and in the hands of Jim. He is going to make shrink wrapped wiring harnesses for each model as we go. He is "Mr. Detail" with this stuff and very excited to be a part of these. ieatOhms, kross8, Ramsay Bolton and 3 others like this. Going to work on one more MOD to try and get on the website before Monday. Probably won't make it - but that just means I can't sell it online, I can still make it Going to be a single 18650 with a battery tube, and more curved and shapely than the boxes or the Side by Sides - trying to get it as small as possible. ieatOhms, MarkS and Condensation like this. I love watching this thread, I am enjoying seeing the process so much!! fordyuck and Absolute-Wood like this. Technically, they are on the market now (the webpage is live) as they have to be there on Monday to stay for the next two years. 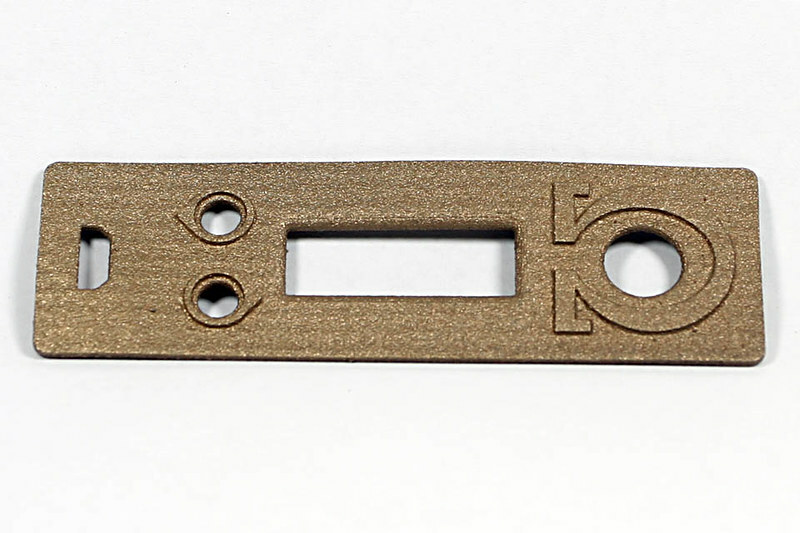 The first two proto bodies were machined to the exact numbers on the prints, and all seems good - no changes needed. After test fitting all the printed parts for the first proto, I feel it will go together without an issue - Jim says there's lots of room to work. Lets see how the second one goes - already a machining order issue revealed. The more complicated Side by Sides are next, and as the others, will be first created for ourselves - we'll give plenty of reports and posts on their condition as they get hours on them. We would have to sell one if ordered, but I trust everyone will wait to see how the story unfolds. I'm pretty telling when talking about things, I think it's important to be. I think it helps to show the challenges of developing and making an enclosure and Faceplate assembly like this. Even better we have great American parts to go inside! I may need a partner to make a PV (I'm dangerous with a soldering iron), but if you can solder, you can make a killer MOD yourself from many sources of something to put the parts into. Other than the enclosure and faceplate stuff, we're just assembling existing parts. You can do it too. BoostAddict, kross8 and Whiskey like this. 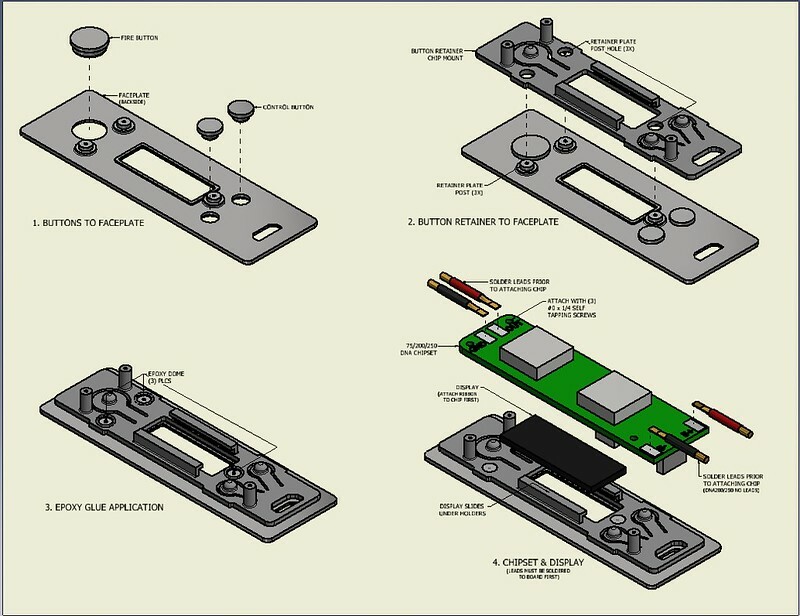 We offer the option of building these as a Mosfet protected Mechanical, parallel or series where applicable, with the option of a volt or MOD meter. I didn't have time to research and source an American made PWM and pot. Probably would have, but I was worried we would run out of time as it's a lot to get done, then I had a slight table saw "mishap" just over two weeks ago - first ever, been doing this forever. It impacted my ability to build the protos for a while and even typing a bit. Much better now. I got lucky and the "bite" was on the last joint of my left thumb, and not bad considering what was biting... When I got back from the hospital, I finished the cut - mainly because the pain killer was still working! I'm going to add an option to choose a Big Als's PWM board with Pot. Will work the details shortly. Really like the battery sled with the board on top - time saver! Just got the PWM option added to the text on the page - need to edit the pulldowns. 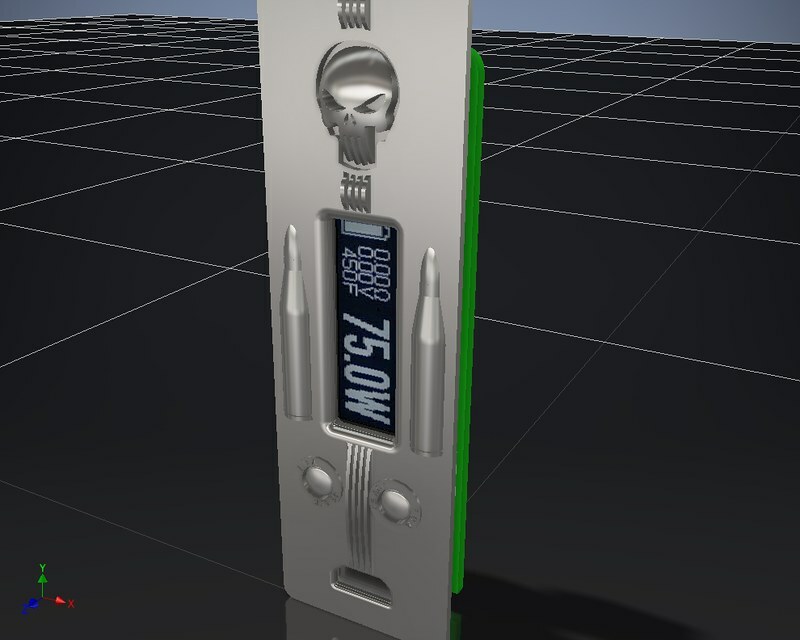 Already have the volt meter and MOD meter available with the Mech Fet option - I'll add PWM to it. Thanks Matt - saw the OKL boards. Didn't know much about the difference, so did some Googling - saw you out there, finally called and spoke to an Electrical Engineer friend of mine about it, came to the conclusion that the OKL boards might present a warranty issue compared to a PWM setup. I've used PWM (Pulse Width Modulation) setups in many industrial applications from smaller motors (<20hp), to large air separation devices with 6000hp electric motors. It's the go to in industry for reliability and accurate throttling. Saw a few posts saying most people couldn't tell the difference when vaping. Both utilize a Fat Daddy's SS Battery tube (18650 shown). The 26650 version will have a slightly larger body. On all models, this allows the choice of an exposed tube, or not - up to the owner. Very nice work! Love seeing your progress and the set up on your website. While I understand your time constraints, your side by side mod looks like it could be fairly easily converted to a bottom feed or squonk mod. I would def be interested in one of those! I think it would also open you to a new group of customers that tend to be very experienced and also loyal. Regardless, very nice job and keep up the great work. Thought about it, I have a couple Kanger Squonkers and like the process. I could add it and worry about the actual design later! Fat Daddy's has the goods... On both, the body of the SBS is "hollowed out" so there is maximum room. Wouldn't take much more than routing the window(s). Only conflicts I can think of is the option of having the fire button below the tank on the "grip" area - might get in the way of the bottle. Fixable. 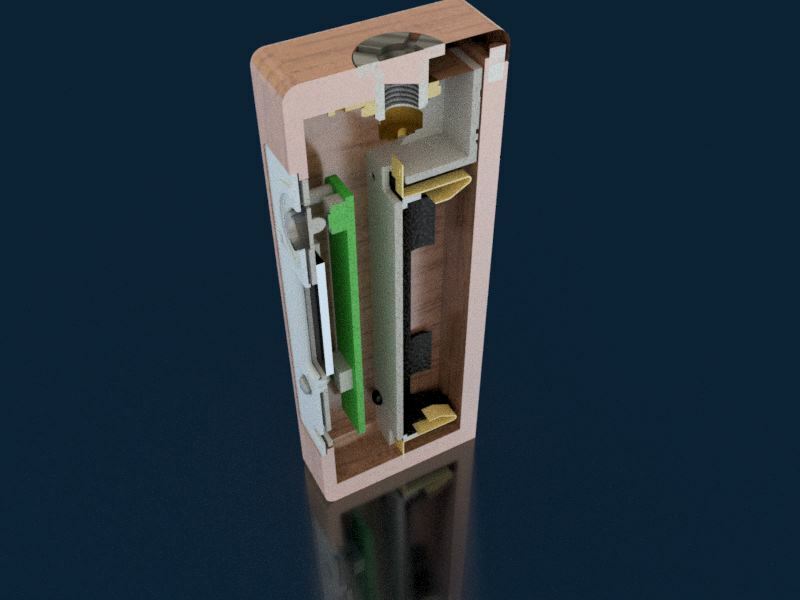 The 3s LiPo option for the DNA200 would take up most of the room in the body cavity. Thanks, good idea. I'm working on all the option pulldowns for the two new mods now. If I add it to the text section of available options, it's "available". Well, we have many, many options added to the MOD page. I still have a ton of minor design chores to work out the finer details of some of the options. I'm in neutral at the moment - friggin virus! A viral "bug" swept through my house - first my wife got it; Poor girl, hit her pretty hard. Then my daughter also got sick - now I'm holding the bag. The only one left is my son - afraid you're next Bud! 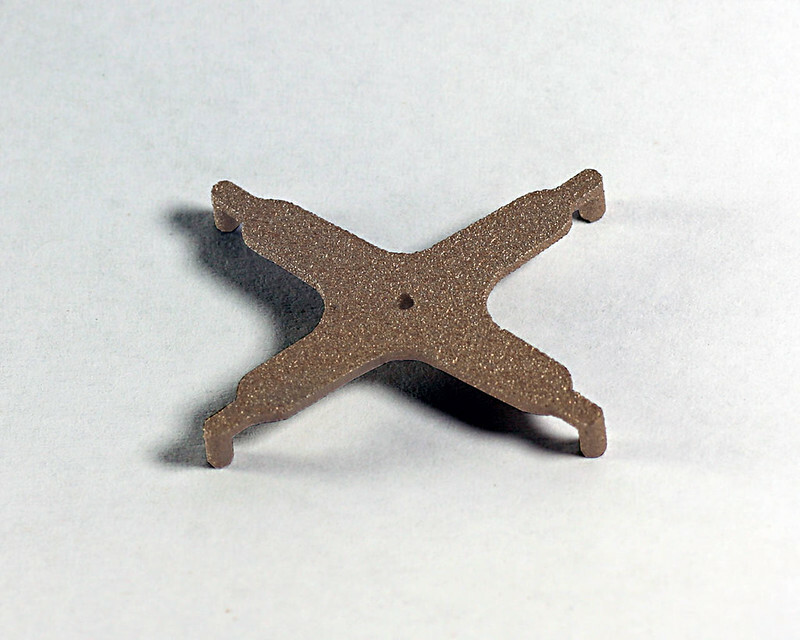 On Proto news, Jim is waiting on some small assembly tools to get going this weekend. Should have a working proto next week! Because of being under the weather, I haven't gotten any farther on the second proto. Soon. I have to admit, the timing of events recently have been almost eerie... I had a table saw incident that made me tend to concentrate on design work, causing the business to have six mods with many options. The plan was four with some options. I remained healthy in a house of sick people. I finished the last update to the MOD page at 11:55pm 8.8.2016 and went to bed. I woke up sick as a dog the next morning... Thank You to the Vape Gods! Still need to order plastic first run parts to check fit, finish and resolution (3D Printed). Ready to clear coat the Rosewood Mod II Proto. Hope to take it with me on Wednesday when Jim & I will assemble the first proto - a Mod I. Might get started on the second one too. More news and pics as they happen! 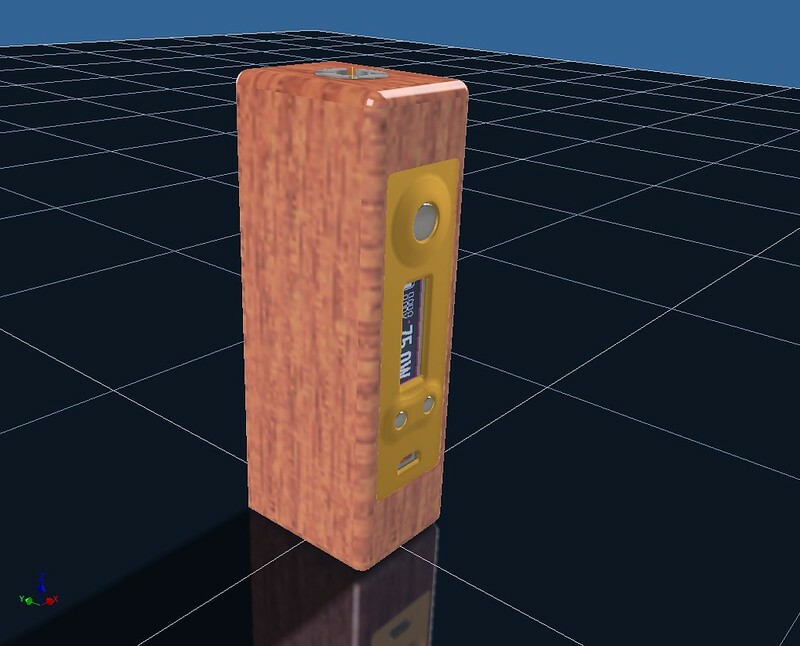 VapinChevy and leaningtreewoodmods like this. Short story is my soldering partner, Jim, hurt his hand and arm at work Tuesday. A little beat up, a little bloody... Jim is a previous SWAT & K9 cop - "retired" but works in a more covert vein of enforcement now. Talked to him today, and he seems to be "back". So, no assembly party - I'm bummed. I'll have a second body ready for assembly when we get together on Wednesday. 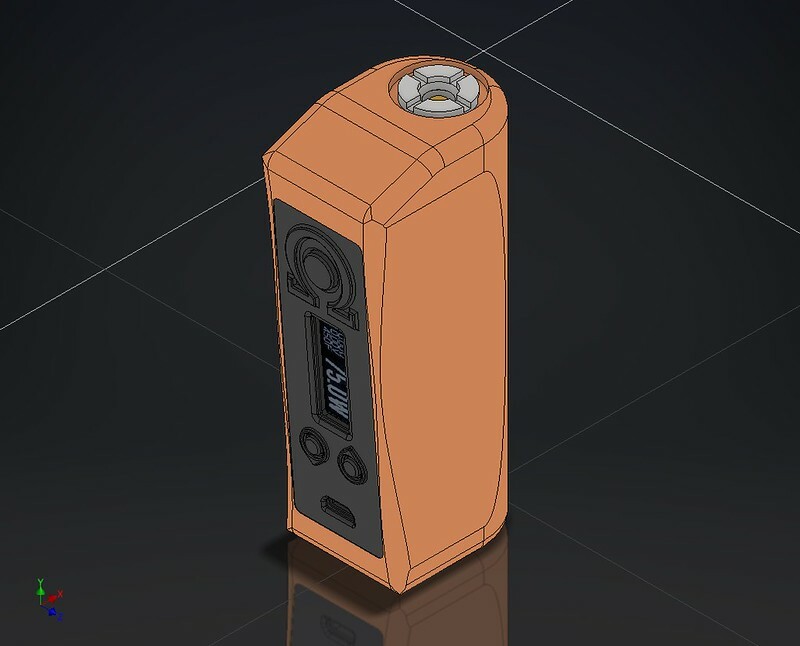 I'm going to start on the third proto body in the next few days, a Mod IV 26650 Squonker. I'm ordering some 3D printed parts to test fit, and should be moving forward shortly with it. I'm waiting on samples now to see if the resolution is good enough to render the text around the control buttons - hope so. 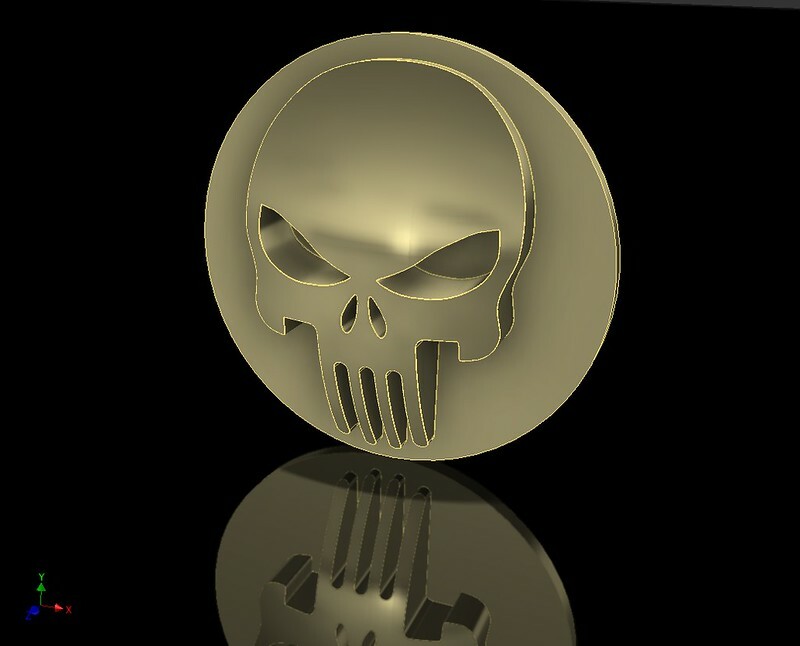 If not, may get it without the text and see about having a jeweler engrave it. I have a US maker of aluminum faceplates and SS buttons, and I have a couple samples. I'll get them photographed and placed on the Mod page shortly. skt239, kpac73, VapinChevy and 2 others like this. Ok- Having some issues with the 3D printing. Having to get second run parts on a few items - some are stainless. 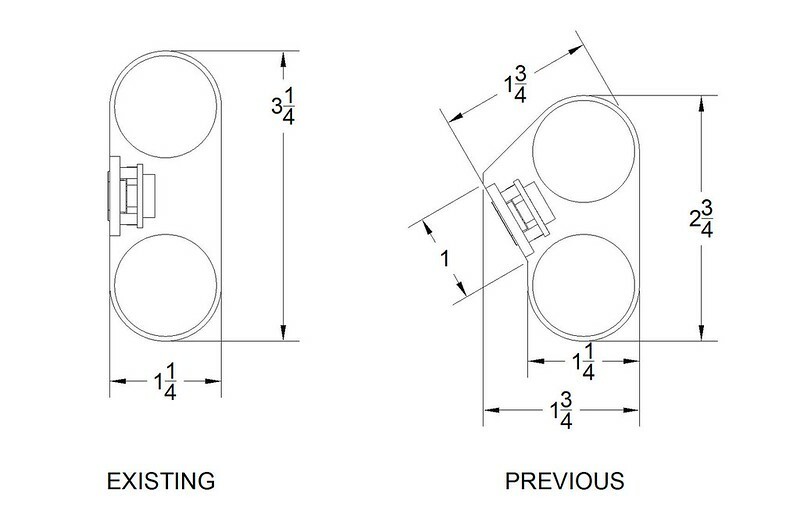 The orientation of the object when printed is important to how it looks when finished. 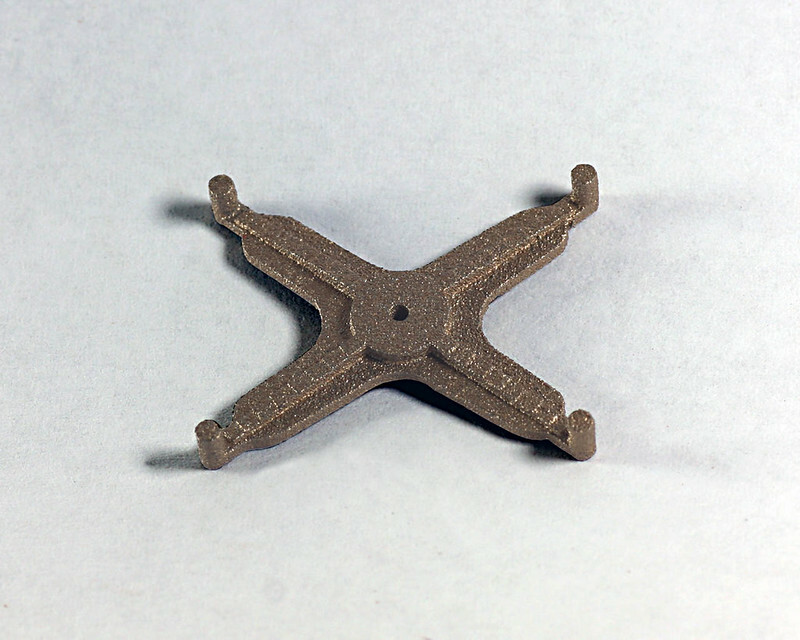 I had to ask for some parts to be reoriented and printed again. Stainless steel parts take a little over two weeks. This means I have at least a two week waiting period before I can get moving on the proto units again. Jim is still having some issue with his hand - we'll pick up again in a bit. But, a silver lining for me - I have three new display stand orders to work on! Still waiting on the 3D Printer items. Been working on a few Display Stands in the mean time. The tankwell depth has been reduced to 1" to accomodate a 10ml bottle. The decorative air holes in the sides of the tankwell have been reconfigured as smaller to fit the shorter depth for drippers. In the video you will first see a SS tube surrounding the bottle - this is a modified Fat Daddy's 26650 SS Battery Tube. It creates an isolated area for the 10ml oval bottle and the connections in case of a failure and/or juice spill. There is a flexable rubbery plastic bottle holder that allows proper orientation of the bottle (it can be turned 90 degrees). The connector will be a VariTube VT 510 Bottom Feed connector designed specifically for this use. A length of SS tubing extends from the center tube of the connector and into the bottle. 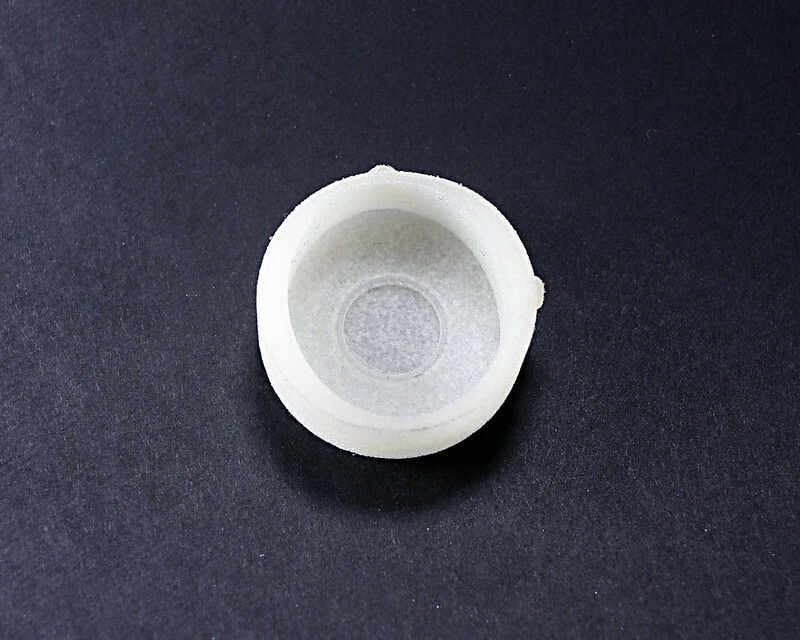 A 3D Printed plastic Bottle Retainer sits around the connector tube and seals the bottle when pushed up over the retainer. Very similar to the Kanger design. Jim & I will be working today to possibly finish assembling the first Proto or two. I would love to be able to take a few good photos - we'll see! inspects and VapinVegas01 like this. The connector is a Fat Daddy's V4 (long) Bottom Feed connector designed specifically for this use. A length of 2mm tubing fits inside the center tube of the connector and extends into the bottle. 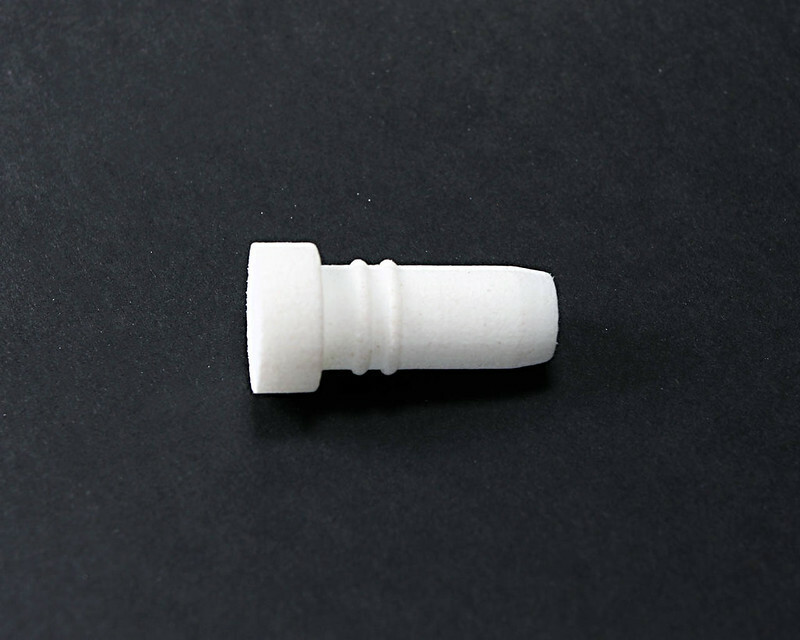 A 3D Printed plastic Bottle Retainer sits around the connector tube and seals the bottle when inserted. Can I ask why you recessed the 510 into the mod? This could create some real issues with atty's. 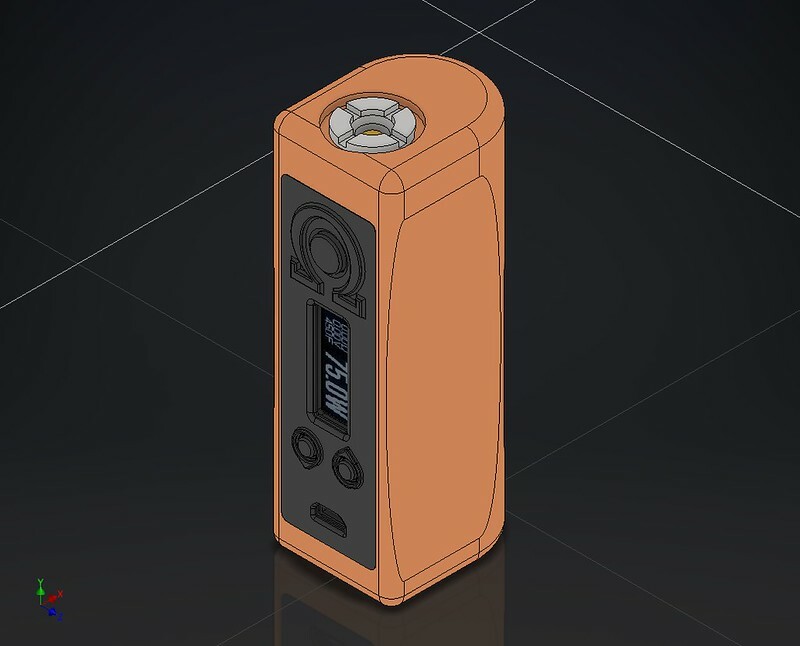 I have always wondered why someone hasn't built a hybrid squonk mod. Build the atty into the top of the box, and eliminate all the parts and labor of building the 510 . Thanks - The recess for the atty or dripper is just the style, a Side by Side. 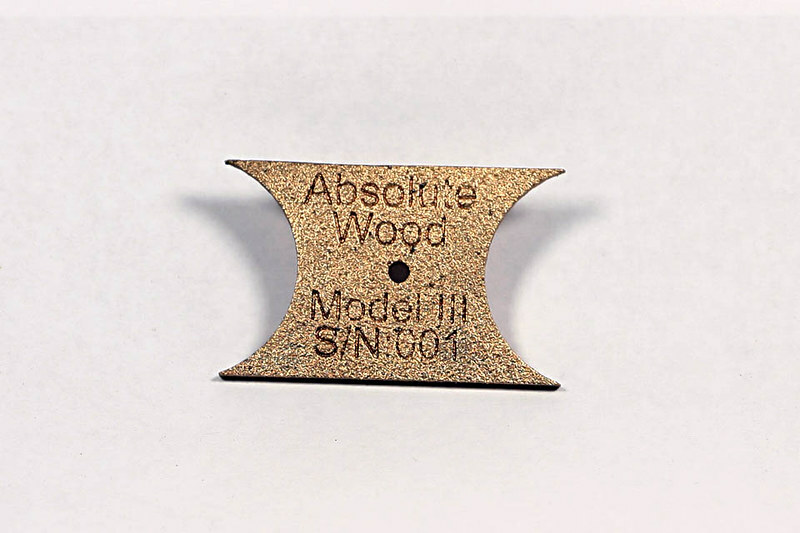 I've not seen any SBS devices made of wood - they're all metal or plastic/metal. The three decorative cutouts around the recess are for airflow as well as giving a place to rotate the atty or an adjustment band from the base. The recess is 1" in diameter, so it can fit 25mm attys. OK- Got a few messages that the FDV BF connectors have problems with leaking. After some advice and some research - Decided to go with the 22mm VariTube VT510 bottom feed. Haven't updated the model yet - or the animation. Soon! Surprise - vapemail from VariTube just showed up with the connectors in it! 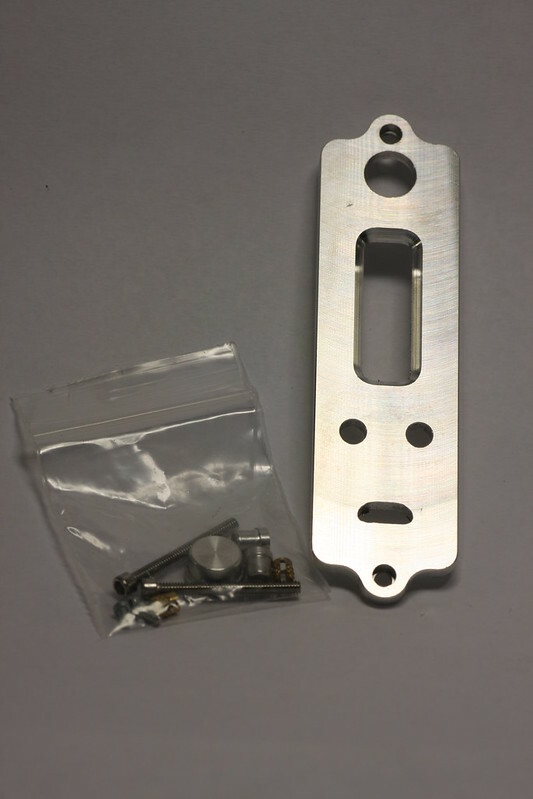 It's for the standard Faceplate assembly used in most the Mods. Hope to have some more news soon! NGAHaze and inspects like this. Your build process and progress is amazing! It truly is amazing watching you work. I am VERY interested. 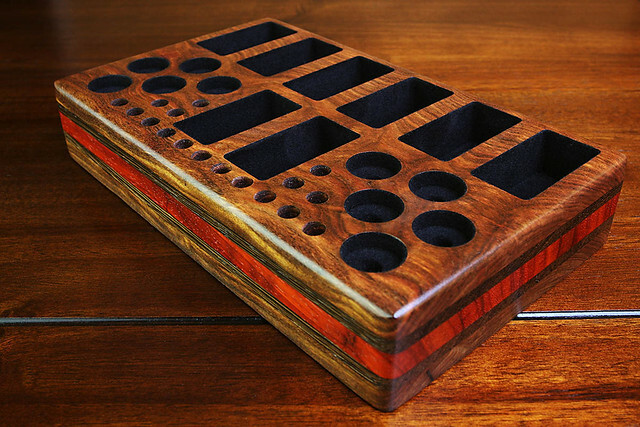 And, I am in love with your Caribbean Rosewood Sandwich vape stand. 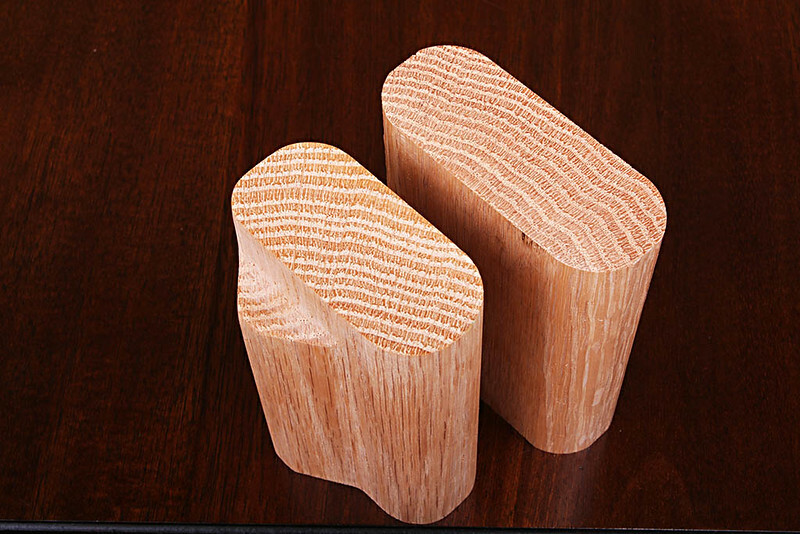 That is an absolutely beautiful piece of wood working. When you are ready to sell, please post here again. We're all watching...and waiting. Thanks for the kind words - I really enjoy the process; & that stand was a favorite - great wood that time around. 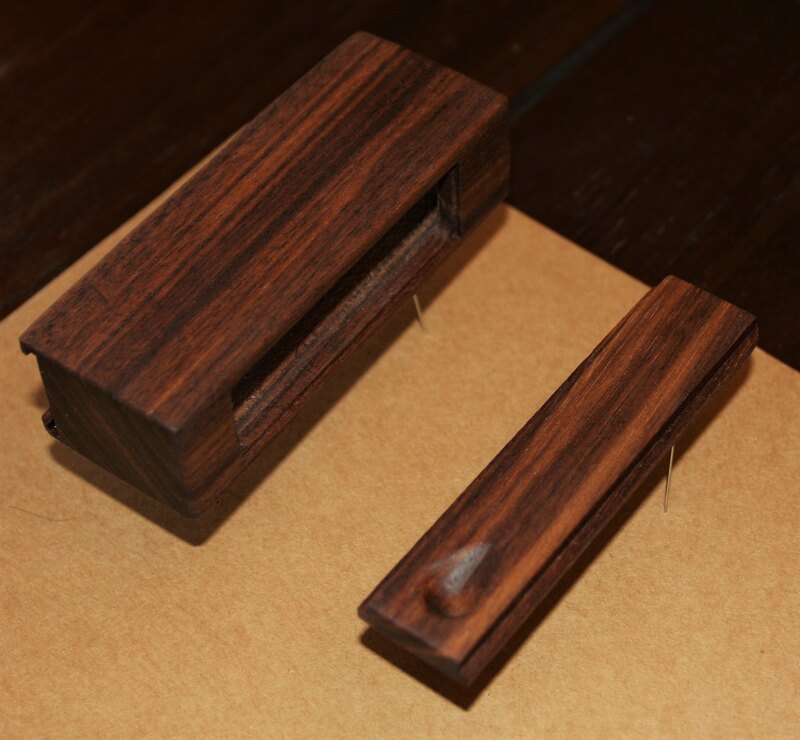 I've got a Model II MOD body that has Caribbean Rosewood, but came out much darker. Different plank, and I used a different oil on it. For those that don't know - we have a photography thread in our forum - here. 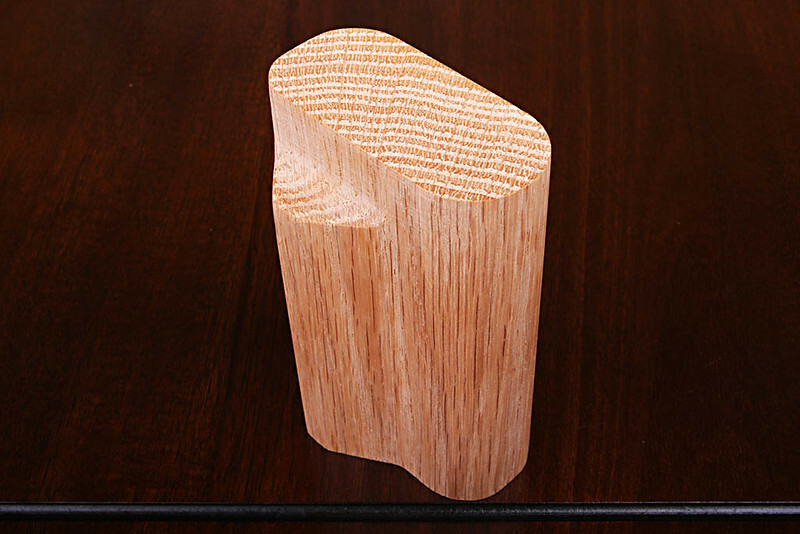 You'll find lots of pics of vape stands, including the Rosewood one. We have two bodies completed - awaiting proper assembly and wiring. I'm writing the assembly procedures as we speak - I want the ability to recruit another solderer/assembler if needed. Having detailed "how to" documentation is vital. Man, it's been a week already. My partner Jim is having some availability issues because of his job - he unexpectedly left for over a week and couldn't say anything... and is leaving this week to Tennessee for several days - that's all I know . 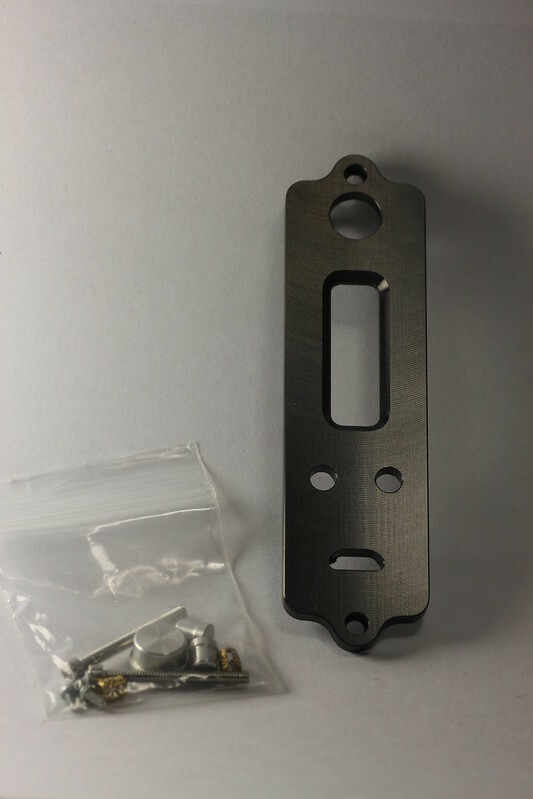 Sorry for this, but we're still having some issues with vendors, and I'm looking into a new vendor to Cerakote the Faceplates and other exposed metals. Also available in brushed finish (not shown). 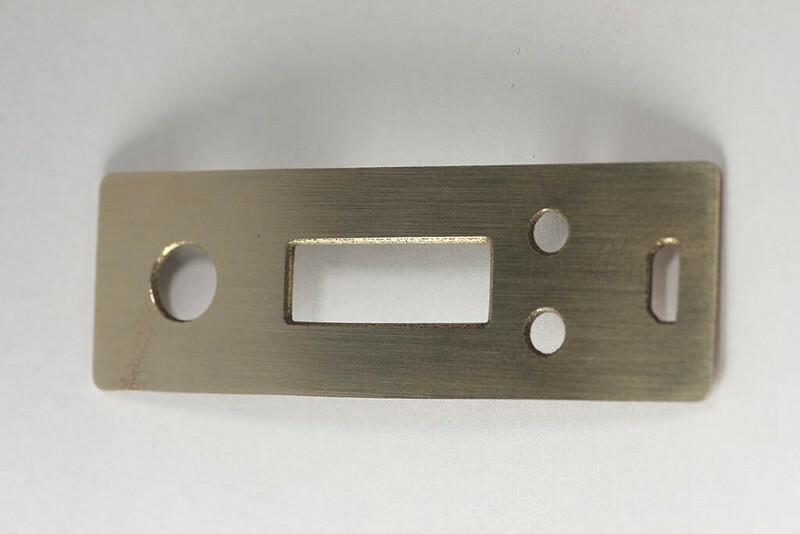 This is the upper plate from the pic above of the two faceplates. 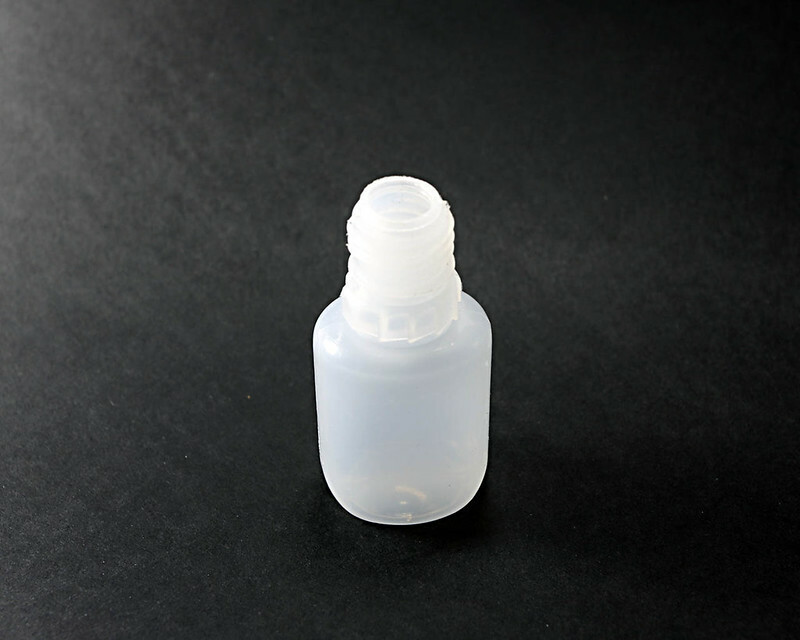 Holds 10ml, made from very flexible LDPE. 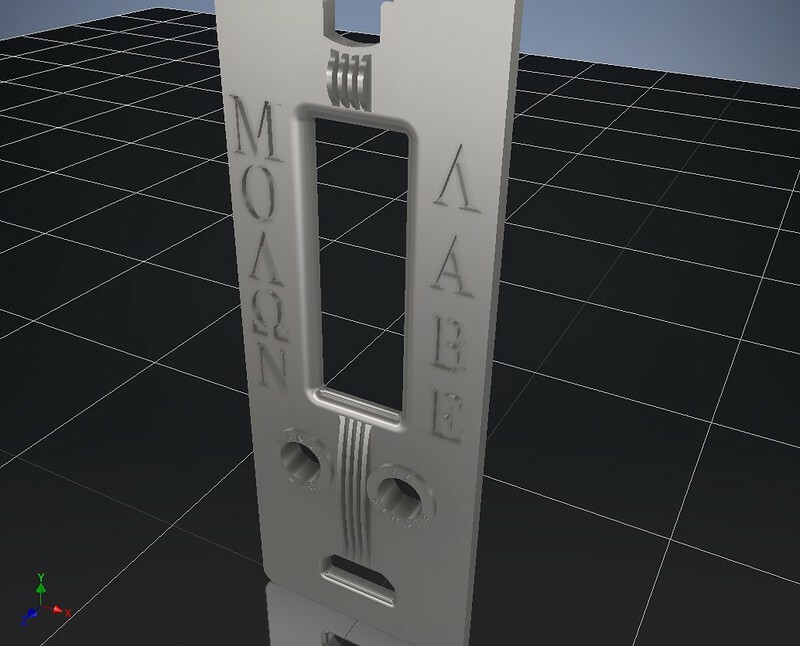 Here's a view looking at the bottom of the Mod III Squonker. You can see the X shaped bottom support in the body. 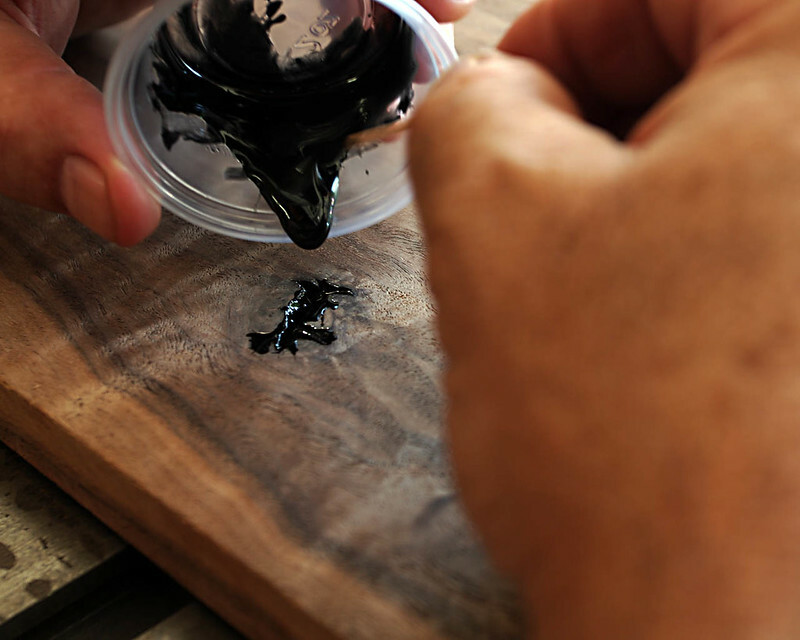 This piece is epoxied in place, and strengthens the body and accepts the bottom plate (in black). Above is the side of the support that faces out. Above we see a view of the bottom side; notice the reinforcing ribs and the buildup around where the support will be threaded to accept the bottom. Here we have the bottom of the Mod. Some of the details are too small to render properly - the text around the control buttons is too small and will not print correctly - it will be removed. 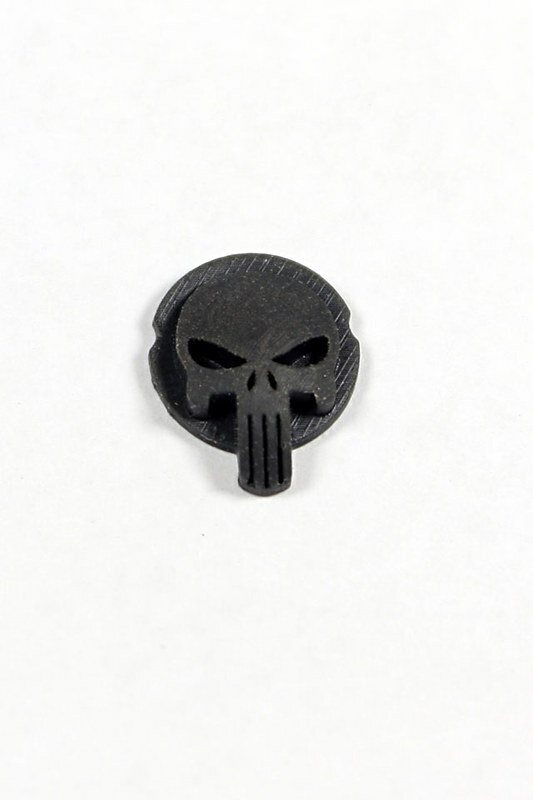 There is a new, higher definition plastic material that I am going to try a few sample prints to see how that looks. My last post I was excited that a drill bit for the battery tubes had arrived and I could get going again on the Squonk Proto. When peeling the plastic off the cutter, it looked horrible - discolored like it was sharpened and got way too hot, had a small chip, and not accurately made. 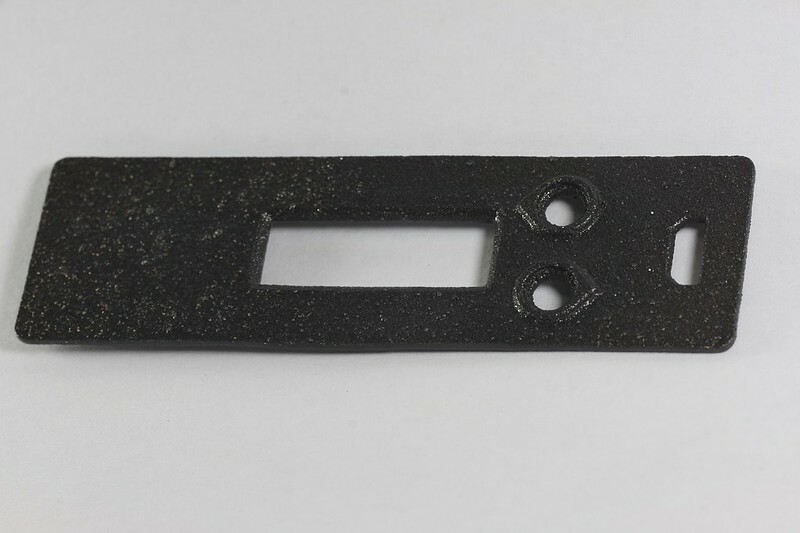 This is a German made bit, the manufacturer is well known for high quality. Not what I expected when paying almost $70 for a single drill bit... It's on it's way back for a replacement now. I'm still waiting on some new SS 3D printed Faceplates to send off for Cerakote test. 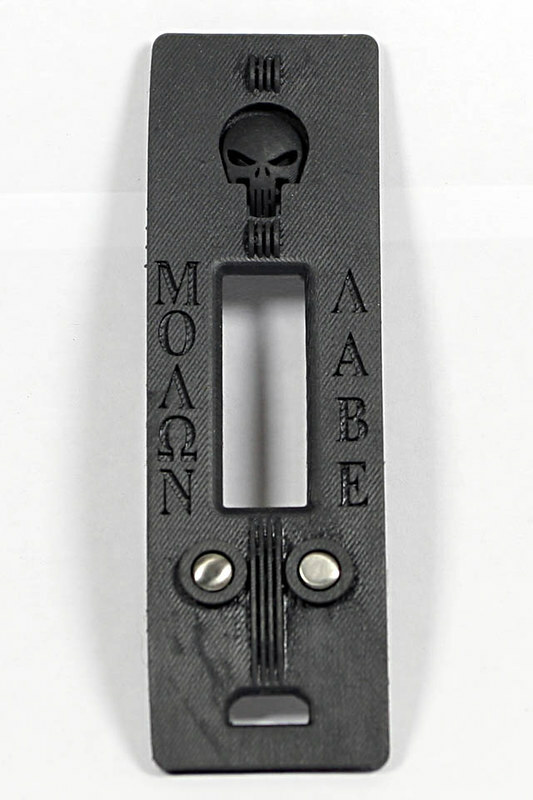 Also in the same shipment is a new print of the Skull Faceplate pieces in a new, high definition black plastic. I've really been busy in the shop with other projects. 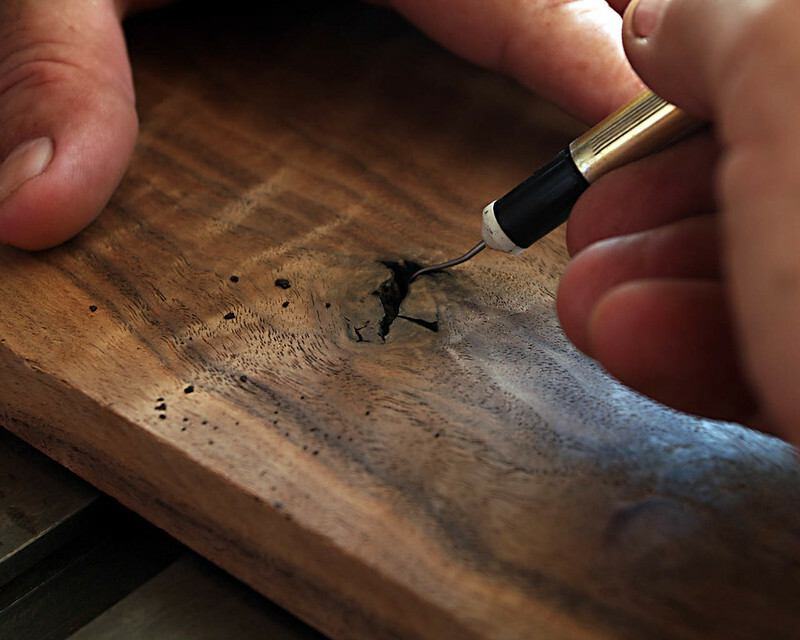 Thought I'd share the process of filling small anomalies in wood with epoxy. 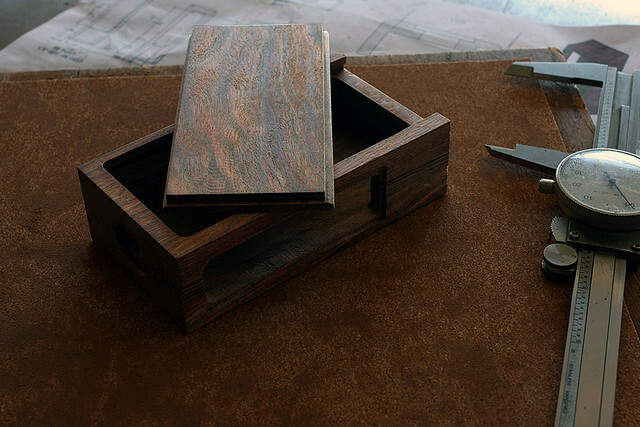 This is often done with figured wood and dyed stabilized wood. 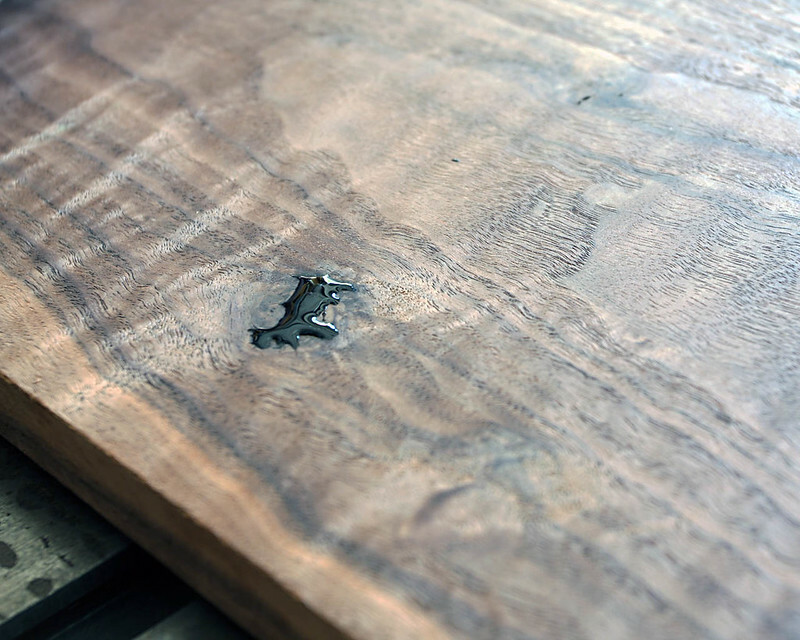 My instance is with some beautiful highly figured American Black Walnut. I'm saving some of this unique wood for Mod bodies in the future. If the void goes all the way through the board, the other side gets the same treatment, then the bottom side is covered with tape to close the hole. 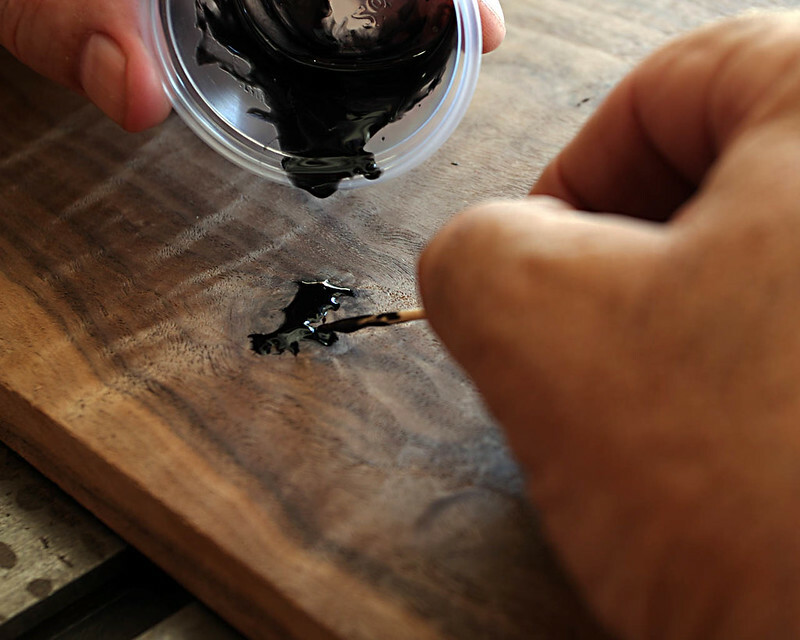 Mixing a small batch, I first coat the inside of the hole by dipping a toothpick and "painting" the inside of the hole. Then I carefully pour so it runs down one side of the crack. This lets it run to the bottom and fill from the bottom up. Letting the epoxy "brim" on the crack a little bit, I use the toothpick to coax the epoxy into all the legs of the crack. Let it dry undisturbed for at least two full days. 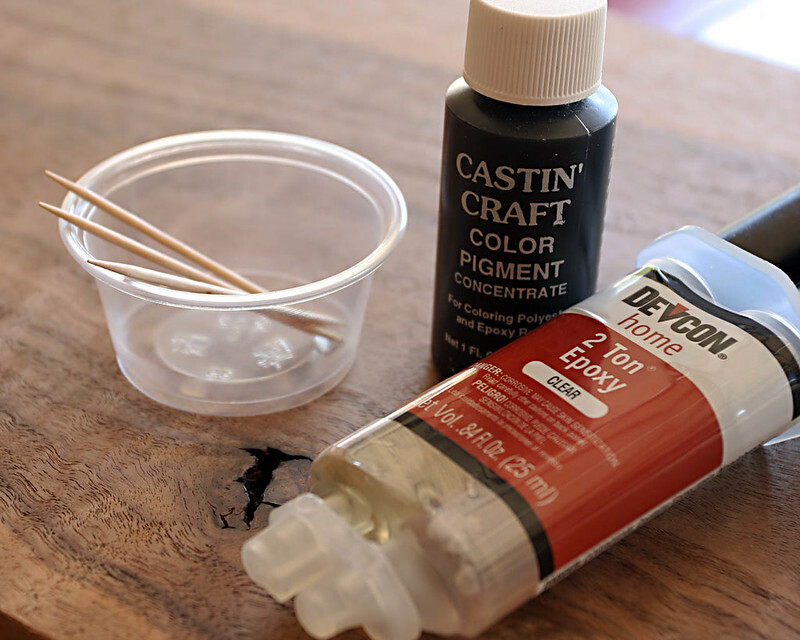 It gets dull looking when sanding, but regains it's glossy look when finished. Here's the finished repair. It will be sanded down flush during the assembly process. You can see a couple really small spots that also need repair. I'm itchin' to get back on the Proto's. I'll post another update when I have some new goodies to photograph! 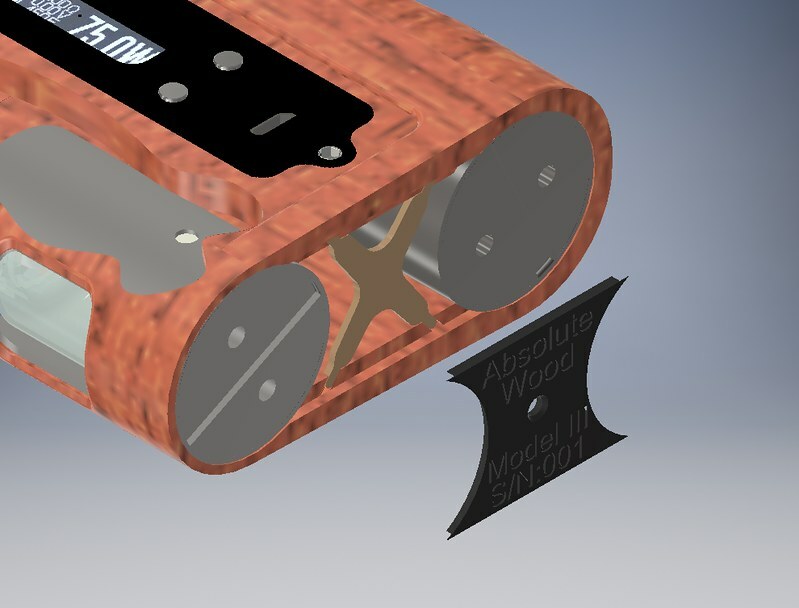 Would the button still be on the faceplate for the mod with the angled face plate? Well, it could. I forgot to add a simple pictorial view - it's there now. Also forgot to mention that in the drawing, the circles in the top of the views are where the tank or dripper would be. The lower holes are where the actual battery tube with battery would be. 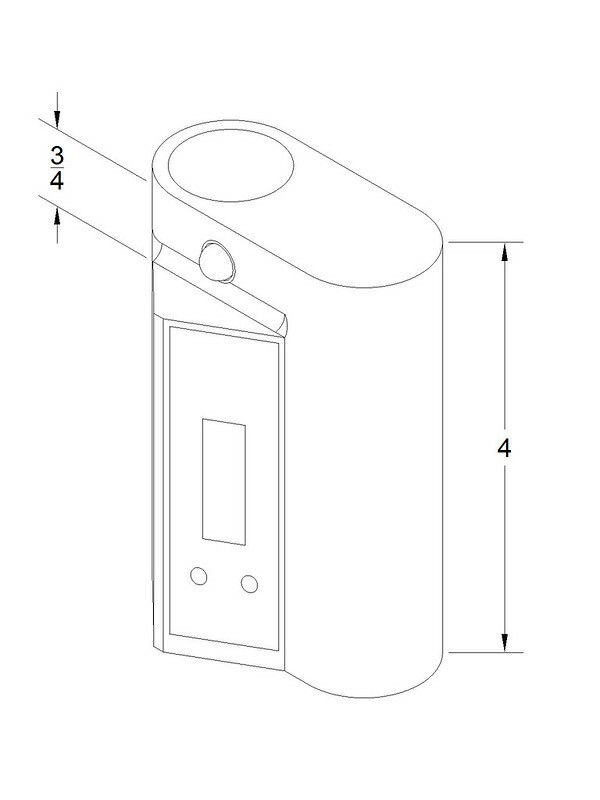 This drawing assumes it is being built as a squonker. 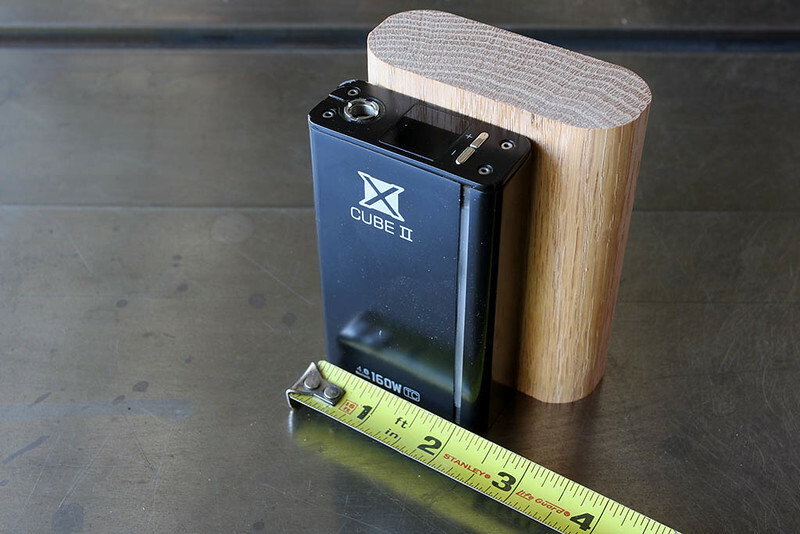 The non-squonk version would be similar, just one battery tube. 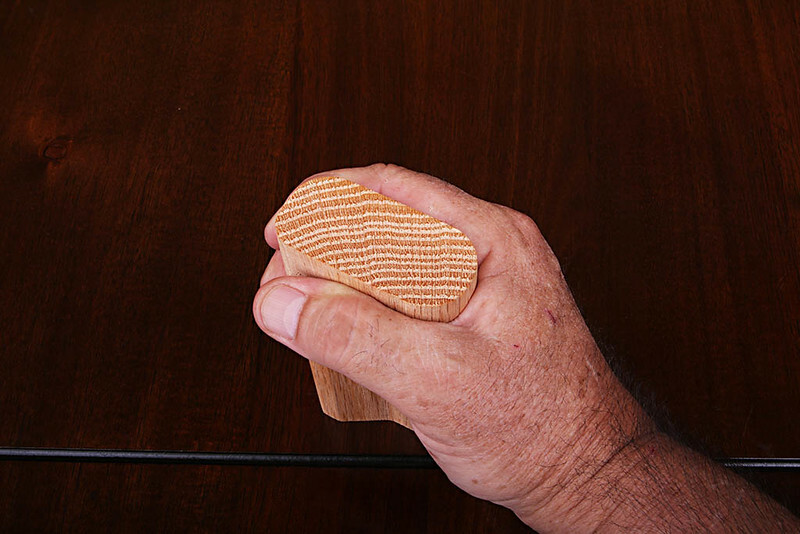 I envisioned holding it with my left thumb on the faceplate button and the palm of my hand and fingers would be wrapped around the part that has the 1-3/4" dimension on it. My fingers would be wrapped around the hole for the atty or dripper in this scenario. 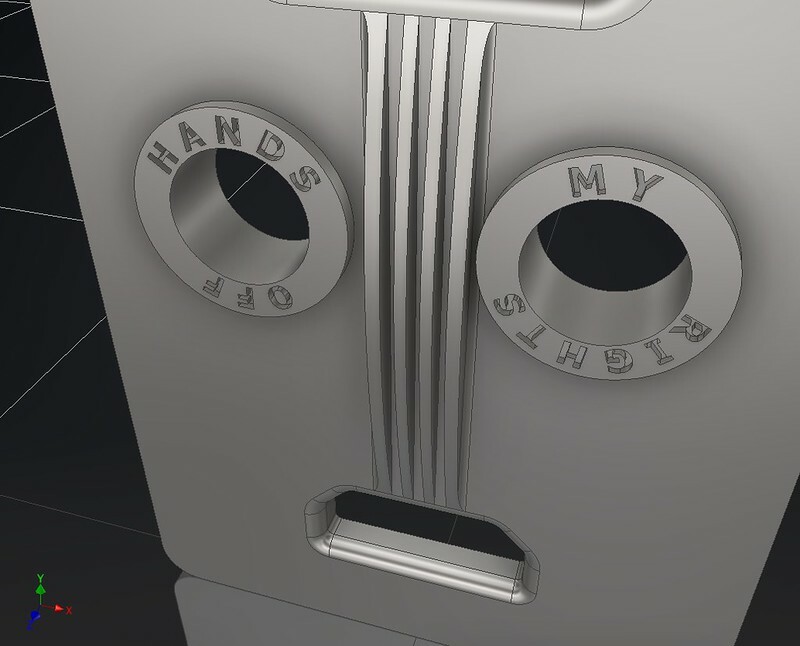 If held in the right hand, the faceplate would be facing away from the user if held similarly. I suppose we could make "handed" versions - one as shown and one that is a mirror image. 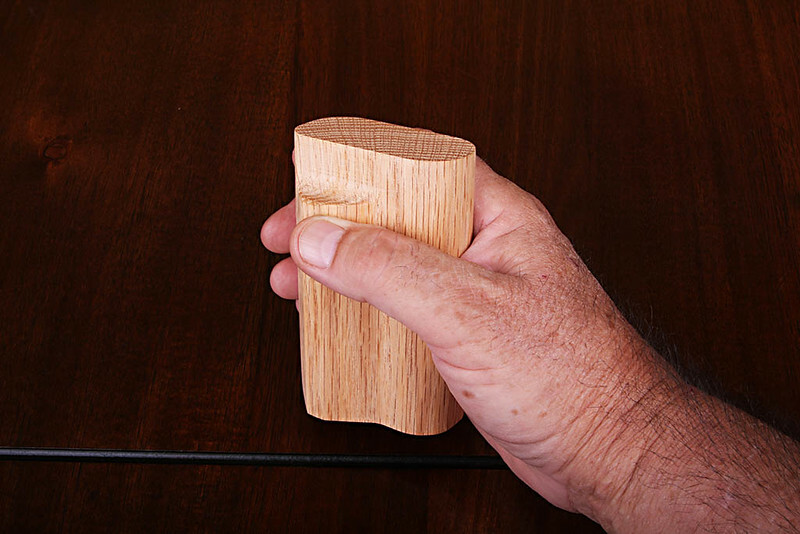 This version in the right hand would have the squonk hole hidden in the palm of your right hand. Left hand holding would have the squonk hole beneath your fingers when gripping the mod. If height permits - we could have a top button over the battery tube. 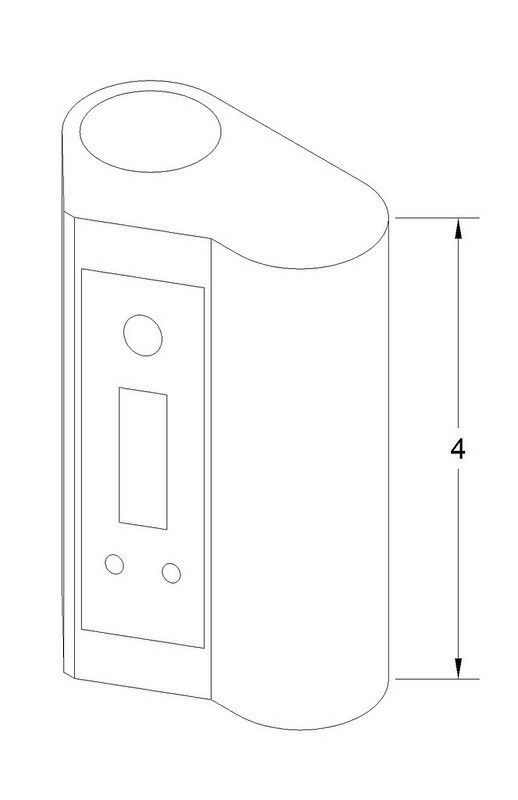 In the pic, I would think that you would grip the mod with your right hand, your palm against the part that has the 2-3/4" dimension. Also looking into the capability to put the fire button above the squonk hole, just below the tankwell. What if you did something similar to the ystick by mini-ecig. Move the angled faceplate down so the thickest part sits in the palm of your hand and your fingers rest in around the narrow side. It would be a side thumb switch, or you could shave it down on the top to make a top thumb switch. Outstanding craftsmanship way to go man. 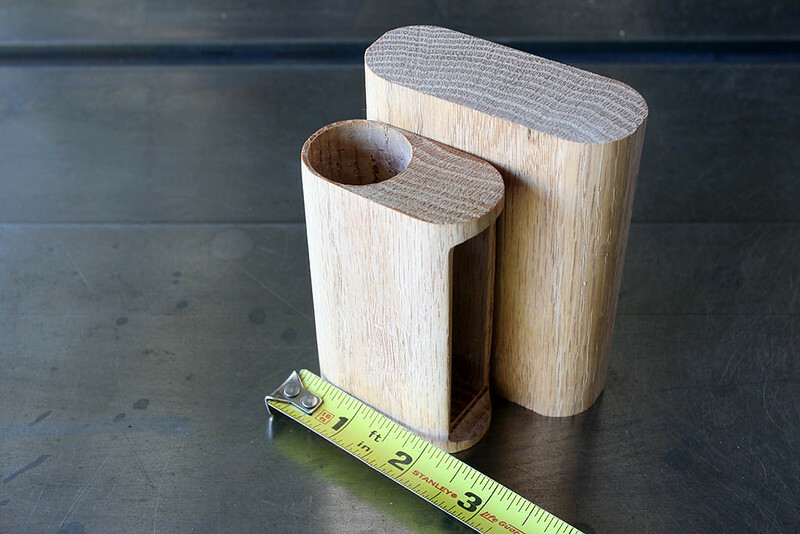 Chels is my hero - That dude is a magician with CNC machining. I want a Xvo Pro... I'll have to look through what designs I have to see if there is anything I can do that doesn't require a new design - unlikely, but I don't want to mess with a Federal agency... it had to exist before 8.8.16. 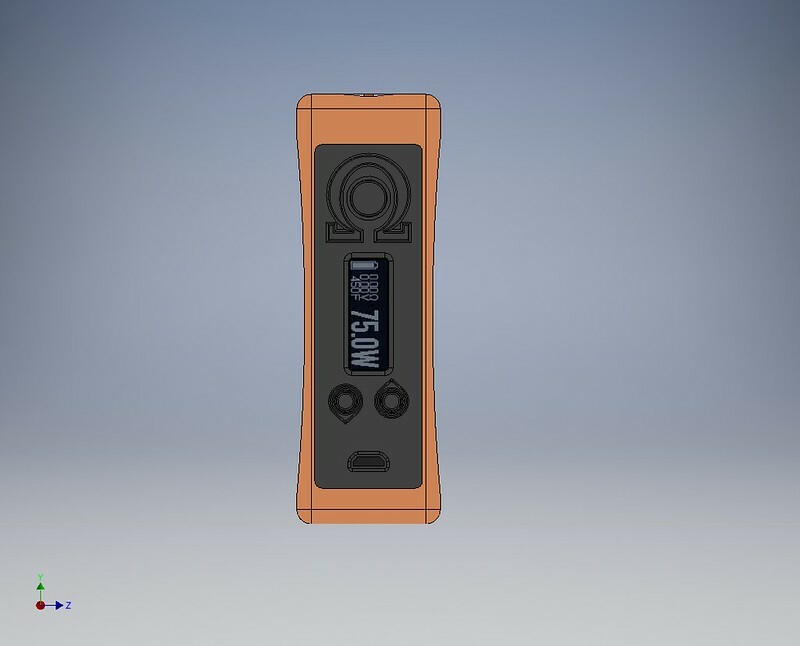 I like the idea of the Faceplate area not going to the top, like the Y-Stick. That might be doable. 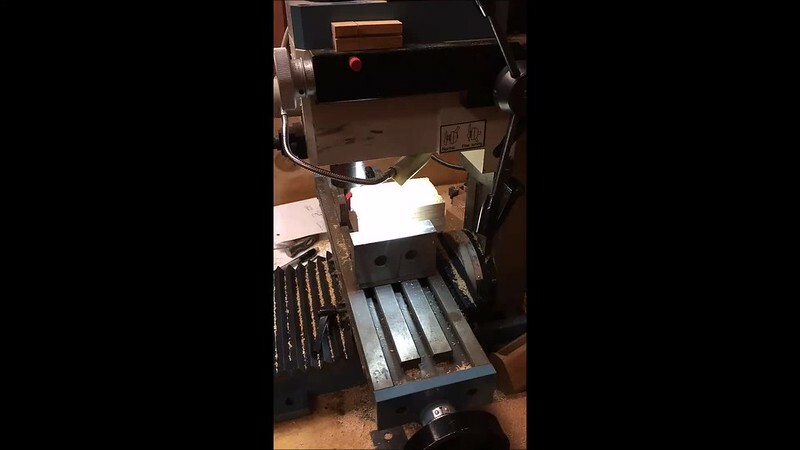 Chels can do much more with the machinery he has and that he's machining aluminum. 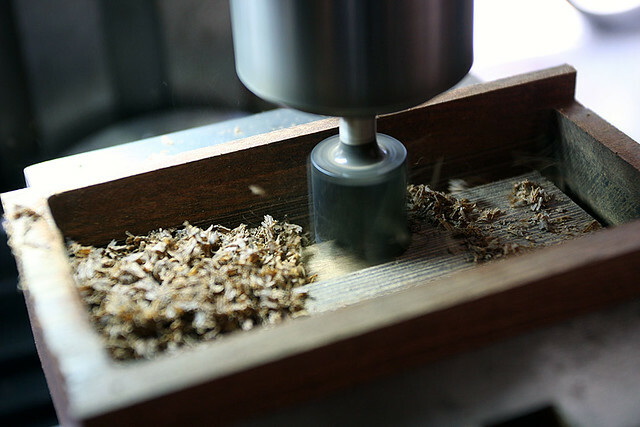 The problem lies on the inside of the body - sometimes it's difficult or impossible to machine a flat surface on the inside to tighten a nut against - with my simple little mill. I'll look at what I might be able to do. After all this, I sure don't want to abandon these two models. I here you man! Those things are beauties. I had a mini cig and I regret letting it go lol. If you decide to switch it up I'll pick one up no doubt. The only thing changed was moving the top of the Faceplate "bubble" down 3/4" and adding the fire button in the space created. The top view would still look almost the same but with the new fire button placement. That's what I was thinking, as long as there is enough room to do so with the DNA board installed. 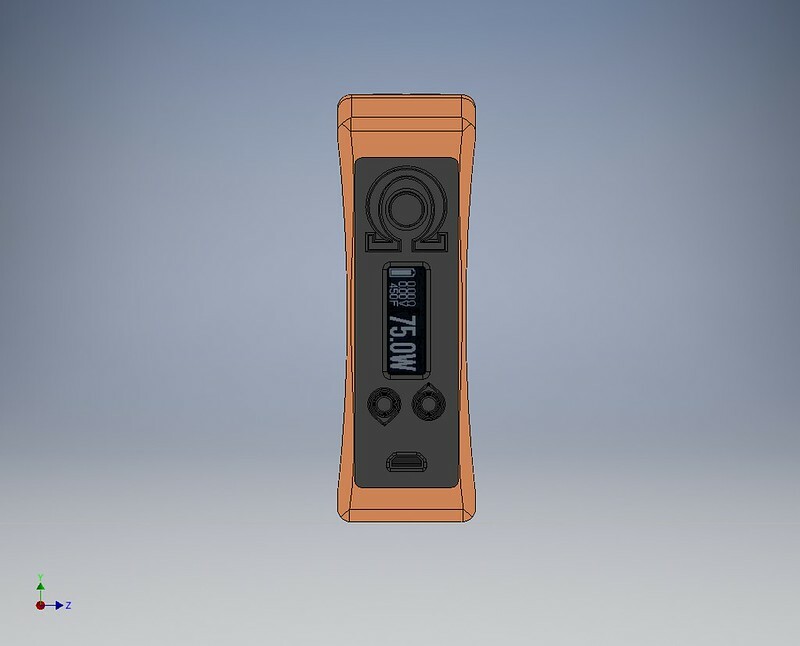 Should be - In the drawing, I just erased the fire button on the FP as we have one without the hole for a remote button. I moved the FP and the top of the protrusion down 3/4" and it looks like it still fits. I need to work the details, but the board screws to the FP assembly and usually if I can fit the FP on the Mod, it will work because everything is smaller than the FP. Only need to verify for the depth - but we're already good there. I think the only part(s) I'll need to change is going to be the bottom piece that goes between the two tubes, and maybe the X brace in the bottom. I'll model the body shortly so I can place it in the 3D Model. 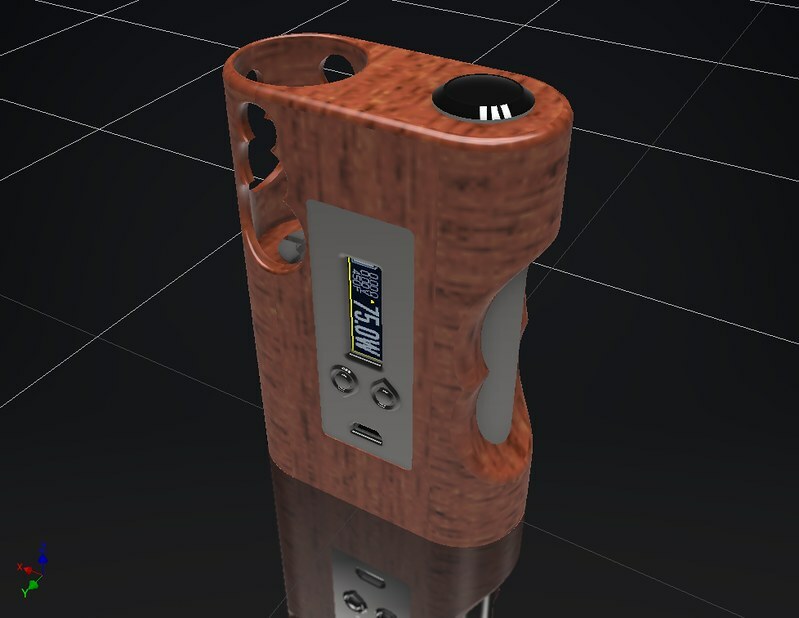 I'm also working on several vape holders and need to start work on the last proto - a Mod VI in stabilized wood. mjag, Pancho_Brown and leaningtreewoodmods like this. 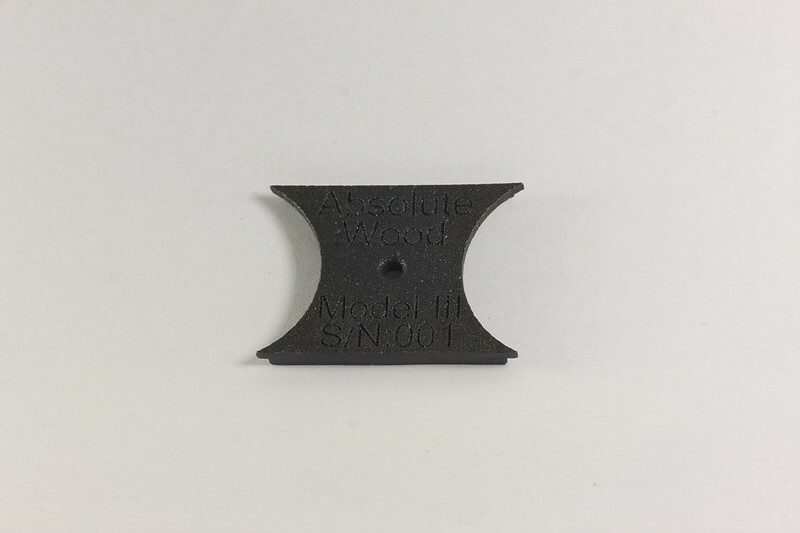 This is one of five blocks I have in stock for some of the Mods (the Side by Sides need a bigger block), I'm working with the manufacturer to get larger blocks for Models III & IV. I hope to get them photographed properly and available on the website soon. Just got back from our trip to Northern California - beautiful! I want it, Rick. That is a gorgeous blank. I'm such a sucker for these wood mods. I'll be watching as the creation comes together.